Olive leaf extract benefits include a wide range of medicinal uses, however there is an easier way to enjoy all of the goodness that can come from these often forgotten leaves, and that is in the form of tea. Brewed piping hot and enjoyed simply for the taste as well as potential health benefits the tea made from these leaves can provide preventative properties as well as serve as holistic therapy for some ailments. While olive leaf extract side effects are minimal and mild if existing in users at all, stomach upset has been reported and this seems to be less frequent in users of the tea form of the leaves. If you still need further convincing, then check out this list of the top ten health benefits of olive leaf tea! 1. Lowering Blood Pressure: You might not think of tea when you are considering herbal remedies for high blood pressure, however oleuropein contained within the often forgotten leaves which are brewed into tea is being researched for its ability to lower blood pressure and therefore improve cardiovascular health by oxidizing lipids which can aid in unclogging arteries. 2. Antioxidants: These free radical fighting agents are abundant in olive leaf tea, and beverages brewed from this exotic leaf can contain more antioxidant power than green tea, a product widely known for its antioxidant content. 3. Anti Cancer Agents: Apigenin and luteolin are thought to be preventers of various types of cancer and they are both found in the olive leaf. While the research is preliminary at best regarding the effects these two compounds have on staving off cancer, early studies suggest that enjoying olive leaf tea may help prevent some kinds of cancer. 4. Anti Inflammatory: Use as a general anti inflammatory is a common claim amongst herbal remedies however there may be some truth behind enjoying olive leaf tea to effectively reduce various types of internal inflammation. 5. 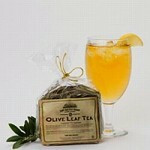 Nerve & Strokes: Olive leaf tea may have some benefits to stroke prevention and encouraging good nerve health. Studies conducted on animals are showing early evidence into this potential olive leaf complex benefit. 6. Diabetes Control: There are studies that show that consuming olive leaf concoctions can help stabilize blood sugar and contribute to better management of diabetes. 7. Antibacterial: Touted in ancient times as a celebrated antibacterial agent, olive leaf tea can contribute to better overall health and a reduced risk of infection. 8. Anti Fungal: If you’re looking for ways to prevent toenail fungus, consider the benefits of the olive leaf, an ancient remedy that is thought to help prevent and fight fungus in various forms that can occur inside and outside of the body. 9. Fat Burning: It’s thought that by increasing production of thermogenin within the body that olive leaf tea might contribute to faster and more effective fat burning. 10. Anti Malaria: Are you planning on traveling to a region that is fraught with malaria carrying mosquitoes, you may want to consider enjoying olive leaf tea during your journey. It’s thought that the contained compound cinchonine can provide anti malarial properties.